Hilda Pertha in her Mendocino studio. © Hilda Pertha archives. Do not use photos without permissions. 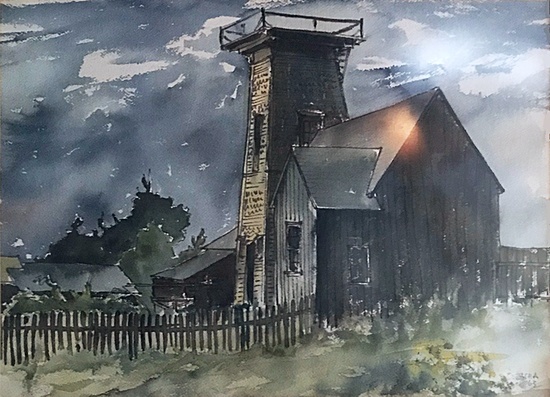 Connie Korbel-Mickey: On February 19, 2014, I launched the first YouTube video, a ‘Retrospective Slideshow’ with a selection of over 60 paintings that spans seven decades in different mediums and styles. Connie Korbel-Mickey: I worked with a California art collector recently who was in the midst of cataloging an extensive collection of early works—1950s-1970s—by Hilda Pertha. From a preliminary selection of scans I compiled a slideshow of rare sketches and small works; most have never been seen by the public before this. Most of these small pieces are best recognized as the early evolution of later major paintings, including modulars of her favorite subjects of the redwoods and botanical gardens. Others represent studies on her beloved Norway. Connie Korbel-Mickey: This slideshow video contains about 70 sketches by Hilda Pertha spanning several decades beginning in the mid-1960s. Very few have never been seen by the public before. Connie Korbel-Mickey: This slideshow video of small artworks on paper, totaling about 70 images, spans 70 years, beginning in the 1930s through 2007. There’s a little of everything. It’s a sampling of the evolution and breadth of her interests and skills. There’s the monochromatic Norwegian rocks that fascinated her for over half of her life and the broad palette of the decades studying the Mendocino Botanical Gardens. Of all the mediums that she created finished pieces, perhaps her most varied—sizes, shapes, materials, moods, and colors — are her collages and mixed media. Connie Korbel-Mickey: This slideshow is a very small representation of sketches, works on paper, and oil paintings on the subjects of flowers, gardens and forests, by Ms. Pertha, mostly from the 1980s and 1990s. Connie Korbel-Mickey: This slideshow includes a small selection of abstract paintings—oil and acrylics—from the mid-1950s through the early 1980s before Ms. Pertha’s work took a turn toward predominantly garden, floral, redwoods, and coastal themes inspired by the north Mendocino Coast of California and the development of what became her signature India ink paintings. Connie Korbel-Mickey: This video, a small collection of about 50 horizontal photos, spans three decades (1980s-2007) and represents a variety of Ms. Pertha’s ink styles developed over those years. The likelihood that another artist will ever duplicate her methods is doubtful as the specific imported paper she used is no longer available; other artists will have to find their own way with alternative materials. In fact, in the last few years before her passing, suppliers had run out of the inventory worldwide. She tried substitutions but found them all unsatisfactory. 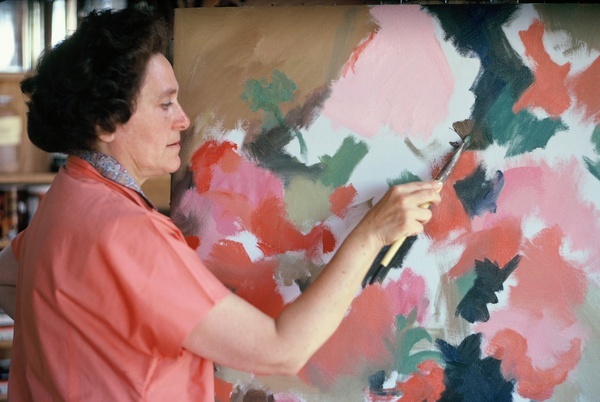 Connie Korbel-Mickey: Hilda Pertha is primarily known as an abstract painter of oil canvases, but over her long lifetime and career she worked masterly in virtually all mediums. She produced collages intermittently, sometimes as studies for other work. This slideshow of images covers about 40 years during which she completed a mere 60-something collages (paper, ink/mixed-media) compared to dozens of complex modulars, hundreds of oil paintings, and hundreds more of her signature ink and mixed-media paintings, and a few dozen acrylic paintings. Connie Korbel-Mickey: Here is the 10th slideshow video of compiled works by Hilda Pertha which she labeled as “Album Leaf” paintings which are much more detailed than sketches, yet much less so than full-blown paintings. They are vibrant images, always titled, signed and dated, often produced as studies of many varied subjects, that I have come to appreciate and enjoy very much.